If you’re a tea drinker, you might start to realize that it’s hard to walk by a new tea infuser in a store without at least taking a look at it, if not taking it home. Copco SnapTea Infuser caught my eye right away, thanks to its bold coloring, but impressed me with its design once I had picked it up. This infuser is designed to sit on top of a cup and brew one serving, rather than being used to steep a whole pot of tea. It looks a bit like a flower (or a scifi flower pod) when it is closed, but the base snaps apart to form a wide ledge that sits on the rim of a mug or cup while your tea steeps. 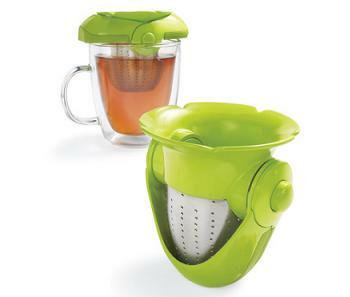 Once your tea is done, the infuser closes to form a handy drip catcher. The only downside is that the infuser isn’t really designed to stand up on its own, so you’ll still have to find somewhere to set it down to avoid getting tea on your desk, even with the drip catcher in place, unless you want to take it to a sink soon after brewing. For a fun-looking tea accessory, I wouldn’t mind this one minor flaw – especially since the drip catcher will keep it from dripping on the way to the kitchen sink.